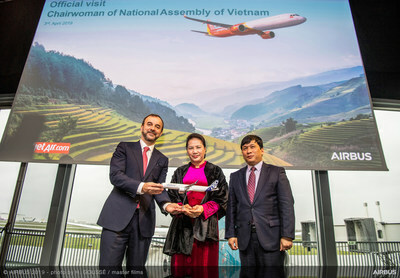 TOULOUSE, France, April 3, 2019 /PRNewswire/ -- Today in Toulouse (France), Vietnamese National Assembly Chairwoman Nguyen Thi Kim Ngan, who along with her fellow dignitaries from the National Assembly visited and attended the delivery ceremony for Vietjet's brand new A321neo, registered as VN-A600 at Airbus's factory. Fitted out with 230 comfy leather-covered seats and high-quality carpeting, the first five rows of Vietjet's spacious new A321neo have been especially designed to accommodate passengers who choose to fly Skyboss, the airline's premium service. The aircraft's interior also features a lively lighting system and a striking decor that combine to create a comfortable and refreshing ambience through the whole cabin. The visit of the delegation from National Assembly of Vietnam to the aircraft manufacturer's factory underscores the significant commitment of Vietnam's national leaders in supporting the development of the aviation industry at home and other affairs related to technology transfer and strategic cooperation within the industry. During the visit, the National Assembly of Vietnam's Chairwoman Nguyen Thi Kim Ngan insisted in her speeches that Vietjet has been a pioneering airline, positively contributing to the development of the national and regional aviation industry. She noted how the Vietnamese aviation industry has been growing continuously while Vietjet has been among the fastest growing airlines in the Asia-Pacific region. Vietnam's economy has been benefited greatly from the contribution of tourism and investment segments. Vietnam's government has given considerable attention to supporting the development of aviation. As a result, the aviation industry in Vietnam is a rising star at the moment, making large orders of aircrafts, building new fleets of modern planes, especially the private airline Vietjet. Speaking at the delivery ceremony in France, Mr. Jean-Francois Laval, Airbus Executive Vice President Sales Asia, said: "We are pleased to be an aircraft manufacturer of choice for Vietjet, one of the fastest growing carriers in the Asian region. We congratulate Vietjet on their latest A321neo delivery. At Airbus we are honoured to be a key partner of Vietjet, and we look forward to seeing more of our aircraft flying in its colours." Marking a milestone in this relationship, this A321neo is also the 60th aircraft of its kind that Vietjet has received directly from Airbus, among a fleet of almost 80 aircraft that the airline is operating. The new aircraft will immediately join fleet operations in April 2019. 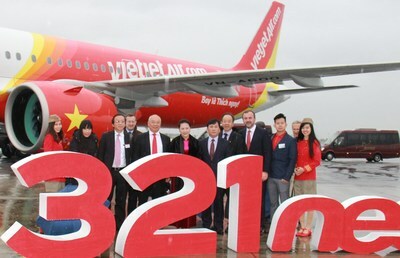 Speaking on the occasion of this special event, Mr. Dinh Viet Phuong, Vice President of Vietjet, said, "Vietjet is currently operating a fleet of new Airbus A320 family aircraft with an average age of 2.82 years, making it the youngest fleet in the world. The A320 family aircraft has greatly contributed to Vietjet's impressive operation performances, including the airline's technical reliability rate standing at 99.64%, in recent years and to be among one of the airlines with the lowest operating costs in the world. The delivery of this new A321neo today once again emphasizes Vietjet's great efforts to grow and modernize our fleet, so we can continuously contribute to the growth of tourism and economies across the region, while meeting our utmost objective, bringing maximum comfort, joy and safety to our valued passengers."